These floor boards have caused me so much stress. If after this I never have to think about this 150 square foot span of walking space again, I’ll die a happy lady. I swear this is the last post about floors and I’m keeping it fast. After the cork plans burst up into flames, (don’t even get me started) we were feeling pretty low. Hence the months-long gap in writing a blog post about it. As I was chronicling the woe to my family (and everyone within earshot) over my brother’s wedding weekend, my very smart cousin asks, “why don’t you just paint the floor?” Hmmm… I guess, why not? During the demolition we had one of those magical finds you only see on HGTV (right after I swore off the channel as #fakenews): we found original hardwood flooring underneath the linoleum tile. It was pristine condition and absolutely gorgeous, except for one minor issue: it wasn’t the same wood as we have in the rest of the house. On one hand, it’s original flooring, *swoon*, but on the other hand, it’s not going to flow with the rest of the room. Talk about a conflict! Plan 1 of this saga: Do nothing. Our contractor swore that the wood would match up, not exactly with the rest of the house but close, with some polyurethane. It would be gorgeous *original* hardwood floors. Just give it a couple coats and a little bit of time – it’ll all be fine. Turns out, it looked like bare wood with some polyurethane on top… definitely not the look I was going for. Plan 2: Try a polyshade(colored polyurethane) on top of the floors so we can create a tint without actually coloring the wood. While an easy, quick, harm-free fix, it just wasn’t going to work. When you’re spending all this money and time on renovating your kitchen and updating everything from the electrical to the faucets, it would be pretty embarrassing to have the floors look like a budget DIY job. Despite our contractor’s best try, I wasn’t sold. Plan 3: Find a stain that our contractor would put down. Kyle and I went to the hardware store and stocked up on those small stain cans. After much tested trials, we didn’t feel confident in any of the options – or our skills in recognizing which color worked best. Some of these colors did match pretty well, and actually might have been fine, but after they set in over 24 hours we found the colors changed significantly. Plan 4: Try again with someone who has matched woods and floors “hundreds of times” in DC. I spent a week digging into this and found a local company who had dozens of reviews on every site, example pictures of their projects and everyone I spoke with was beyond confident in their abilities to do the job – it’s what they do after all and they’ve seen it hundreds of times. It pains me to tell this story, but I’ll do it one more time. I asked how they didn’t know this already – isn’t that what they were here to do? I asked what stain they believe is best for matching the woods and helping the transition boards transition to the rest of the boards. I then called the company to ask why nobody told the flooring guys what the job was. Yet, we moved forward still. To be fair, the guys did a pretty darn good job mixing up a custom stain. However, they missed an step before putting it down: they didn’t do a wood conditioner. The stain looked great at first but then after about an hour it sunk in way too far into the grain of the wood leaving really dark rings that looked like yellow and black zebra-print. I don’t understand why my communications degree fails me in explaining that I want the floors to transition between each other. It’s fine that they don’t match but… it has to look like it was done on purpose. I won’t go into details about my reaction but the owner of the company had to come out to apologize for the “worst job he’s ever seen” – and say the only remedy would be to tear up the flooring. Or, of course, live with it. Plan 5: We’re ripping it up. 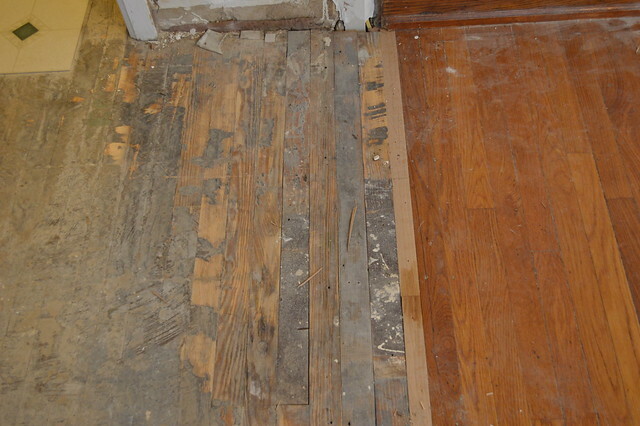 I know, it’s a sin to remove original anything from an old house – especially the floors – but at this point I literally hate the floors for all the pain they’ve caused me and my cats. I don’t see how I’ll be able to be in my kitchen and keep a scowl off my face if I glance at the floors. I have no choice but to take them out. Stay tuned. The exact plan is still being worked out with our contractor but I have a feeling it’s going to be okay in the end. You know how on HGTV the couple gets to take the first swing at the wall they don’t like? 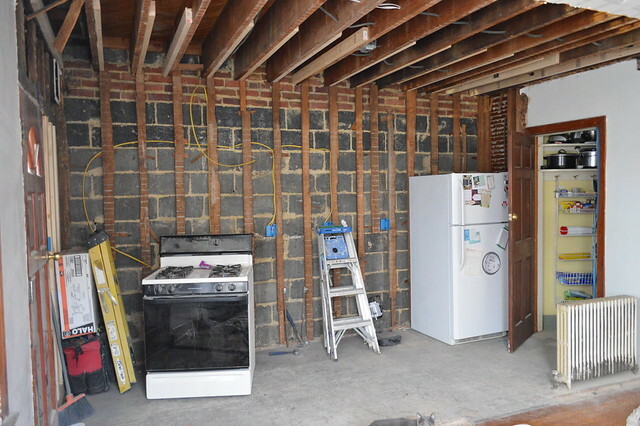 They get to put on some safety goggles, and swing a big hammer at the walls or bust down some old cabinets. Maybe the husband will be sweet and let his wife take the first blow – or he’ll be so excited he’ll just go for it. They’re so full of joy, it’s the first step toward the house of their dreams. They’ve spent years saving up for this, dreaming about it, and it’s finally here! Well, it’s what MY dreams were made of. Unfortunately… as I’ve said many times (so many times) since we bought our house: HGTV is not real life. It’s #fakenews. Our contractor didn’t let us anywhere near the demolition site. We had to be home in case something terrible happened, but we had to spend the day in a separated room. On the other side of the opaque plastic sheeting. Talk about torture! What was going on in there? People keep asking Kyle and I if we could have done this ourselves to save money – because, HGTV tells them it could. The short answer is, yes but only a few hundred dollars (according to itemized contractor proposals). That said, everything was torn out from this wall and cleaned up in less than 10 hours. The next day he came back and did the other wall of cabinets. 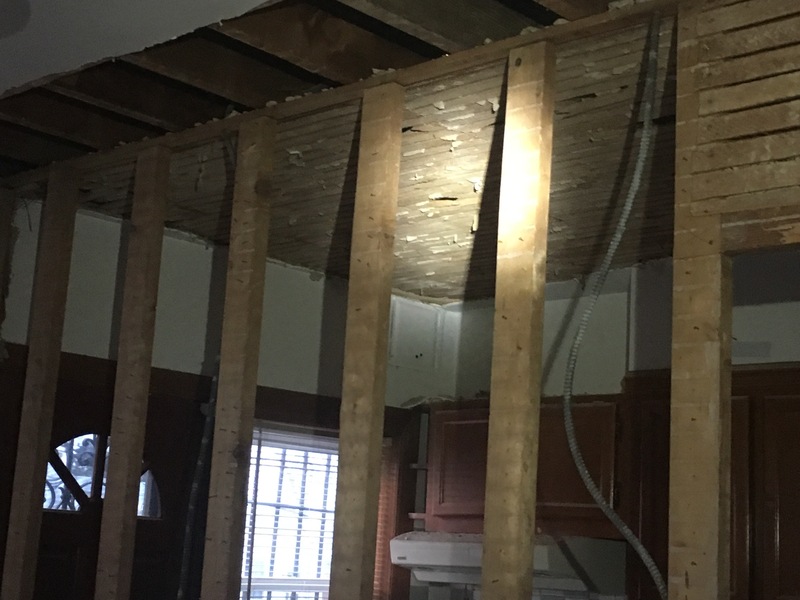 We were able to start on the actual progress of a renovation immediately, where had we done this part ourselves it would have taken a week and some used vacation days. So thinking about it that way, no it would not have been cheaper to DIY. But, I still had wanted to.